It was some years ago when watching a documentary on Amish teenagers that I heard the word Rumspringa for the first time. But that sounds like a Bavarian word!, I thought. At this time I knew nothing about the Amish, let alone their German roots. Everyone knows that German is spoken in Germany and Austria, so I thought it would be interesting to look at the lesser-known language known as Pennsylvania German/Pennsylvania Dutch, spoken in parts of the United States. This is the language that the Amish community (amongst others) speak, and it is also why I understood the word Rumspringa. 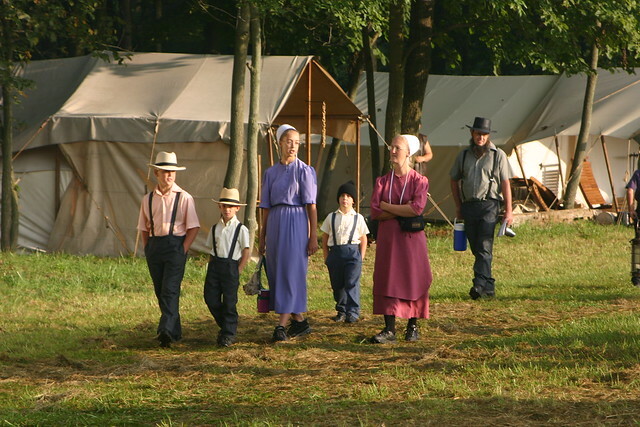 The Amish are a traditionalist Christian religious group who have their origins in Switzerland and Germany. They emigrated to America in the 1730s and settled mostly in Ohio and Pennsylvania. Their official language is Pennsylvania German (also known as Pennsylvania Dutch), which is a variant of Hochdeutsch (standard German). If you know the word Rumspringa, then you already know some Pennsylvania German! First off, a breakdown of the word Rumpspringa: This word comes from the verb herumspringen, meaning ‘to run/jump around’. But the makeup of the word Rumspringa is not typical German, as you can see from the way that ‘herum’ has been shortened to ‘rum’, while ‘springen’ has been shortened to ‘springa’. Pennsylvania German has its origins in the early Swabian dialect, which has similarities to Bavarian – which is probably why the word Rumpspringa caught my attention! The meaning of Rumspringa: It is not literal in meaning – it does not refer to the act of running, or jumping around. This ‘running around’ refers, in fact, to the time of adolescence in a young Amish person’s life, when they can be free to enjoy their youth and try things which they would not be able to do if they joined the Amish church. The idea is to allow them to explore their freedom during adolescence, after which they must decide if they want to give it up and join the Amish church, or leave the Amish community altogether. The idea of Rumspringa refers to this freedom to do whatever they please. Paerdi – This is actually the word ‘Party’. Written like this, it suggests that it is pronounced ‘pear-dy’. So, it almost sounds like the word ‘Party’ when spoken in an American accent, but it is written like a German word. Incidentally, standard German uses the word ‘Party’, too, though the correct word for a party would be das Fest or die Feier. Schtori – This is the word ‘Story’. It is written in a German style (the spelling of ‘sch’ instead of ‘sh’), but is nothing like the German word for story, which is die Geschichte. It is clearly derived from the English word, story, but its spelling suggests it is pronounced in a German way. Deitsch Schtor –Deitsch is Pennsylvania German for Deutsch. Schtor comes from the American English word store. In other words, ‘Deitsch Schtor’ is describing a ‘German store’. Like the word Schtori, Schtor is derived from English, but is written to be pronounced in a German way. The German word for store, by the way, is das Geschäft. Now let’s hear some of this German, shall we?! Here are two wonderful examples of Pennsylvania German being spoken by natives. What do you think of this type of German? How much of it can you understand? I live in South-Central Pennsylvania and about 50-60 years ago, this dialect was widely spoken among Amish and non-Amish. Non-Amish from my parents’ generation only know a spattering of words and my generation did not grow up learning it. For a couple hundred years, it was considered the language of the uneducated and later, a dying language. There have been several attempts to revive it–clubs in which the members speak and sing in the dialect, newspapers with submissions of poetry and prose in the dialect, and there is even a first-ever PA Dutch dictionary in the works with all spelling variations. This sounds a lot like what we sometimes call Denglish. There is more English than German, and the German pronunciation is quite eccentric, but that is the way language develops. I am very happy to know that the language is being documented and studied. We have a fairly significant Amish community in southeastern Minnesota, and while slightly disorienting, what I have heard there is not excessively difficult to understand. The English, spoken with a quasi-German accent is at first confusing, but then fairly clear. It isn’t altogether unlike this Pennsylvania dialect. I have also heard, now 40-50 years ago, non-Amish people of German heritage speaking Platt that sounded very much like my grandparents spoke in the 40s and 50s when they wanted to hide something from my young ears. I only regret that I never had the opportunity to learn the language from them. Having visited the town in Mecklenburg from which my family came, I had a chance to hear the dialect again. And even though I still had no clue what was being said, it brought back very warm feelings. Fortunately, all of the Platt speakers also speak standard German, so we could laugh together! @Allan Mahnke Thanks Allan, that’s really interesting! I agree that you could call it Denglish. It’s fascinating how the two have mixed, and flow so naturally in this speech. This is much like we spoke when I was growing up in North Dakota. My Grandparents were born and grew up in the Odessa, Ukraine area, and their Parents originated from the Strassburg, France area. I loved your article about Pennsylvania Dutch. It is really interesting how languages “grow” and develop in other areas. Have a nice evening! Schönen Abend!